Well, five years in the waiting and it's finally here. Today is my baby's first day of school! 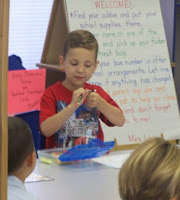 This post is going to be short and sweet, but I wanted to share some pictures of my boy on his FIRST DAY OF SCHOOL!! Of course David was not worried at all while my stomach has been tied in knots all morning! He patiently held my hand as we walked through the halls to get to his classroom. 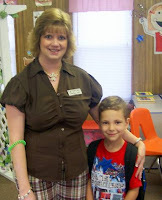 There his teacher, Mrs. Lea, was waiting for us, and went ahead and posed for this picture! David put his things in his cubby (tripping over his chair to get there!) and promptly sat down to use his color crayons with the other children who were already there. We went ahead and snapped a couple pictures of him while he wasn't paying attention to us because though he won't admit it, Tim is just as excited about this as I am! I'm back after a small break friends! And I'm happy to announce the return of the 557 MCT from their deployment to Iraq. This unit of 12 soldiers left Springfield in June 2006 and spent some time training in Indiana. After training the unit shipped out to Iraq in August 2006. The families are SO happy to have their solders home after this fifteen month deployment! Our family is more than happy to welcome back Sgt. Timothy Chenoweth - other wise known as Dad! The boys could hardly stand themselves waiting for the bus to pull in to the parking lot. As the bus pulled infront of the families everyone released yellow balloons with their soldier's name on them and messages of love and welcome! Upon seeing their father Tyler and David rushed to him and nearly tackled him right there on the sidewalk! After kisses and hugs all around we went inside for a brief welcome home ceremony with Maj Boggess officiating. This is a special moment for a few of the soldiers as Maj Boggess was the 557th's Commanding Officer during their first deployment during Operation Enduring Freedom. The ceremony ended and we all scattered as quickly as possible! So, welcome home Tim! I'm SO GLAD to have you home with us and get back to our lives as they should be! So I had a few of the neighborhood kids over the house this week. Tyler and David sure have a great group of friends to play with, but with two of those boys come older sisters who have to keep an eye on them. All four of these kids are great. The two boys play with my two bo ys, one of the sisters stays on my Internet for hours if she's allowed to and the other girl - the oldest - has a love of genealogy and enjoys being crafty. This week I tried a few of my techniques on her and I was very impressed with Miss Beth's craft-itude! She's promised to allow me to practice on her again! Anyway, here is my version of the cards that we worked on together. The first was a variation on the card in the last post. I turned it on its side and added the dingy but everything else - ink and card stock colors and stamp set remained the same though we went ahead and left off the ribbon this time. We used Prisma Colored Pencils with some odorless mineral spirits - called the gamasol technique. 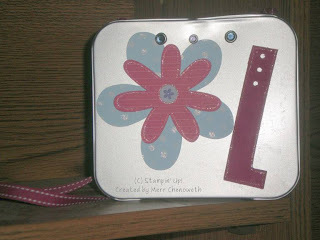 Other techniques include: two step stamping, and masking. Our second card we used Blue Bayou, Apricot Appeal and River Rock card stock, Blue Bayou ink, and the Au Natural stamp set. This is a stamp set that I bought at the end of the last Stampin' Up! year and have just now gotten around to using. I used the flower, she used the butterfly. This card started out as a spot light card, but I decided that I wanted the entire panel colored in instead. I also used holographic highlights glitter with the two way glue pen to get the glitter exactly where I wanted it. 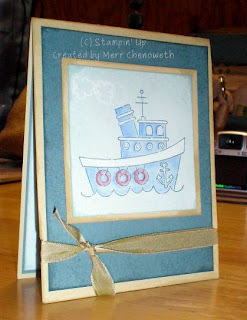 Lastly we died the new Stampin' Up! taffeta ribbon. The color is gorgeous on this ribbon!! What a treat! Our last card was taken from a card I made at Gwen's house not too long ago. She and I sat down and copied a card from a book - I don't know which book, and if she reads this blog before I put up a new post I'm sure she'll let me know the name of the book! Anyway she was working with a Halloween theme for her card, and I chose an "In Color" theme for mine - in other words there's no rhyme or reason to it! I used Big Pieces and Little Pieces stamp sets, Purely Pomegranate, Blue Bayou, Groovy Guava, Soft Sky, River Rock and Wild Wasabi card stocks and inks. I still don't like the Wild Wasabi color but I hope that the more I use it the more I will grow to like it - no good so far! 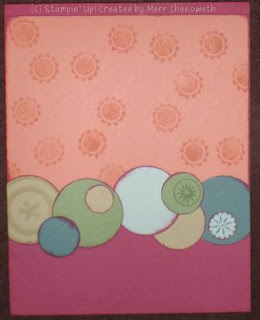 Oh, and in addition to all the products listed above we used every size circle punch Stampin' Up! offers! The last thing I wanted to say before I sign off for the night is to let you know that I may be MIA for the next week or so. 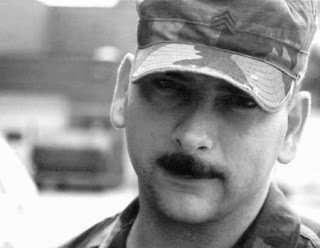 Many of you may know that my wonderful husband Tim has been serving our country on his third deployment to Iraq and has been gone since June of 2006. Our long wait for his return is nearly ended however as he is expected home sometime before Monday! I'm sure you can understand our excitement and anxiety as our reunion draws closer. I hope you will pray for our family during this time of transition - especially for the children who now have to readjust yet again. I will post after a while about our reunion and all the wonderful things that are in store for us! Here's the last picture I shot of Tim before he left home in June. You can tell by the look on his face he was tired of the camera at this point, but I couldn't resist one last shot! I'm lucky he loves me! I debated titling this post "The Great Tooth Hunt," but in the end decided that though it was a funny title it wasn't QUITE fitting for this post. I don't have a lot to talk about the meeting. 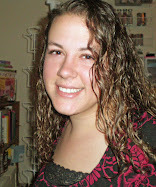 Most of it was business information gleaned from Gwen's trip to Stampin' Up! 's Conference last week. She's come back fully charged and revved to go. She shared quite a bit tonight and I can't wait to implement some of the ideas in my own business! The high excitement of the night however came when Davy ran out to get his tooth from the car to show everyone. (It's the first one he's lost and is so very proud of it!) Unfortunately he lost it on the way back inside. In tears he tried to explain that his Sack of Gluy-a tooth was missing and that he really needed to find it. (As a translation here friends a Sack of Gluy-a is Sacajawea. He's expecting a "Gold Dollar," for his tooth from the Tooth Fairy.) Poor boy. All of the ladies present at the meeting agreed to go out and help us hunt up his tooth. Fortunately it was found!! Tears magically dried up, a smile (a little lop sided cause he's still swollen from having it pulled) appeared and the world was right with Mr. David Grant. He especially liked it when everyone oooh'ed and ahhhh'ed about what a BIG tooth it was! So thank you everyone from David, the Tooth Fairy and Me! OK, with that aside let me present the card I made before going to the meeting. 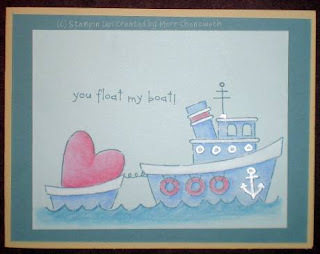 I used River Rock, Soft Sky and Blue Bayou card stock and ink as well as the Boatloads of Love stamp set. 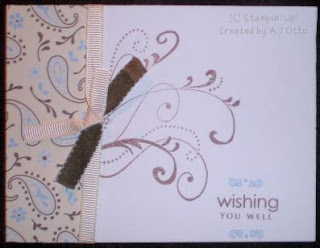 The card is pretty strait forward, the only "different" thing I did was died some of our white taffeta ribbon with the River Rock ink to match. That time of year has nearly arrived! Children dread it, parents wish for it. 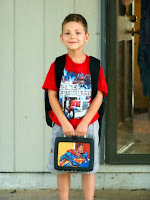 Yes, I'm talking about BACK TO SCHOOL! Or, as in the Chenoweth household, time to go to school for the first time!! That's right, our Davy, sweet, innocent and docile creature that he is will be wreaking havoc on someone else for most of the day soon! Jump back a week in time however and picture me with my child (who is never messy and always does exactly what his mama asks him to) in Staples. We're buying school supplies and Mama's desk supplies, cause after all I do have a business to run too! We're tossing stuff in the cart right and left and the magic item tossed in happens to be a combo-pack of printer ink. So, tonight has been spent trying to dress up that ugly gift card into something I can give to Mr. School Boy to hand over to his poor poor poor unsuspecting teacher on open house two days before school starts. I used Purely Pomegranate and Bashful Blue card stock, the Build-A-Flower Accents and Elements, the Much Appreciated stamp set, as well as my Stardust Pen (non-Stampin' Up!) I went a little crazy with the flowers, but I was enjoying myself and so that's OK with me. I wasn't sure I'd ever make a project I liked with these flowers and it turned out to be more fun than I imagined it would be! So anyway, that's the front of the card. The inside isn't decorated so I won't bore you with any more on the card. 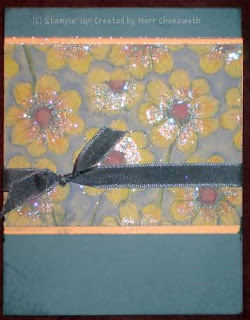 To accompany the card - and hide the UGLY Staples gift card - I used the Accents and Elements tin. First I punched holes at the top with my Crop-a-Dile and threaded some of the Double Stitched Purely Pomegranate ribbon through to make a little handle. I then punched three holes across the top to insert some of our Circle Rhinestone Brads, I used cool colors for this project. 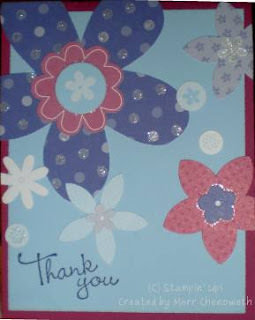 Then I put on some of the self adhesive die cut flowers from the tin on the top, a lot fewer this time though! Time to move on to the chipboard now. I took the "L" letter from our On Board series and covered it with Purely Pomegranate ink. Because I think the "L" looked more like a "1" I cut it up a little to look more like an "L" and punched three little holes down the top with the Crop-a-Dile. Time to go a little crazy with the stardust pen again and viola! All done! I'm actually thinking about going back in and adding more flowers to the tin... I'm thinking it needs something and it may just have to be more more more more more flowers!! LOL!